It’s incredible how fast this year has flown by. Here we are, creeping into November and I’m not nearly ready for the Holidays. As the weather is cooling, and the temperatures are dropping, I find myself relaxing out back with a Caldwell Savages as well as a bottle of Dogfish Head’s Higher Math. The Caldwell Savages essentially a line extension to the existing blend “Long Live the King” that made it’s debut at this years IPCPR show in Las Vegas. 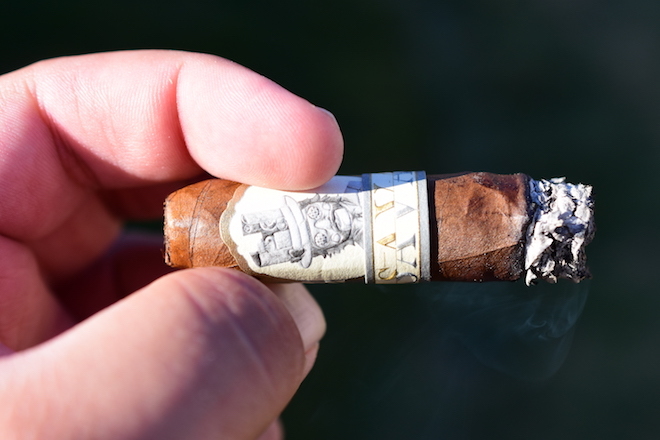 The Long Live the King blend featured a Dominican Republic Wrapper and Binder along with filler tobaccos from both the Dominican Republic and Nicaragua. 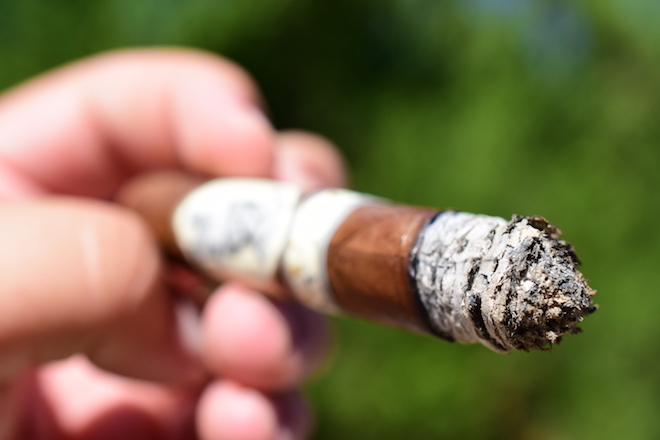 While we don’t know the specifics of the Savages blend, we do know that it features a Habano wrapper and is essentially a toned down version of the Long Live the King. The Savages comes in five sizes: Corona Extra (6 x 46), Corona Large (8 x 54), Pramide (6 x 50), Super Rothschild (4.75 x 52), and the Toro (6 x 54). The Savages all come packaged in boxes of 10 and run between $11 and $15 a stick. 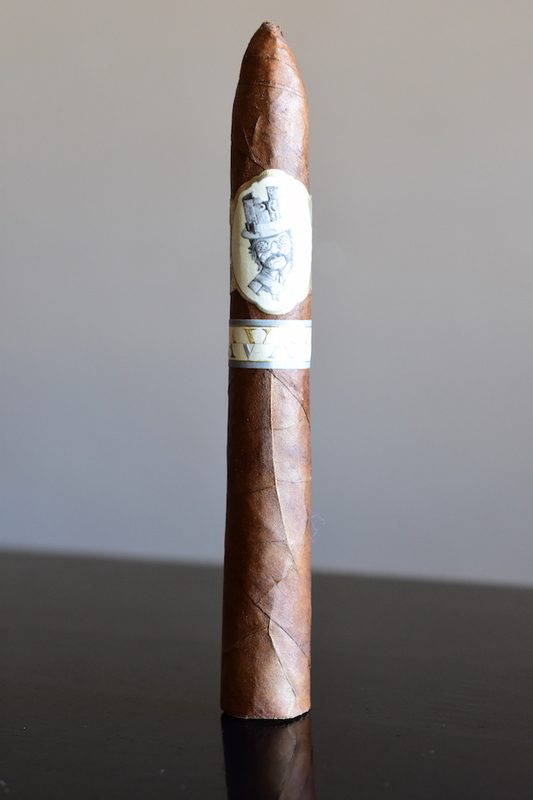 These cigars are very limited, and hard to find as they were only distributed to existing Caldwell accounts that were set up prior to the trade show, and sold out almost immediately. I was able to score a few of these from Atlantic Cigar Company. 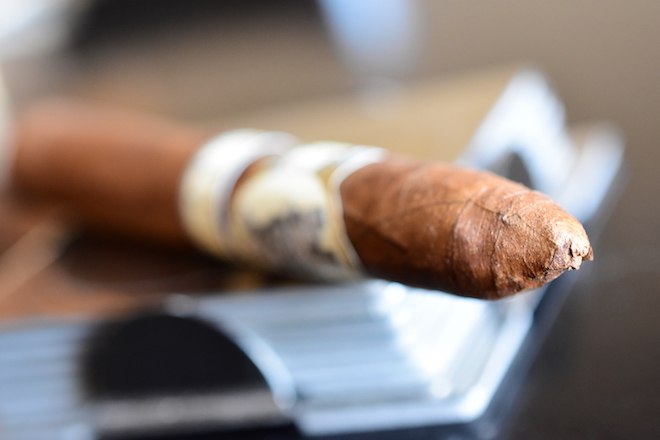 The Caldwell Savages starts out with a tattered, rustic looking wrapper that carries a calico mixture of light and dark browns, as well as some yellow and orangish areas scattered throughout the cigar’s wrapper. The wrapper showcases a good amount of natural webbing in the leaf along with a pretty gritty tooth and decent amount of oils. 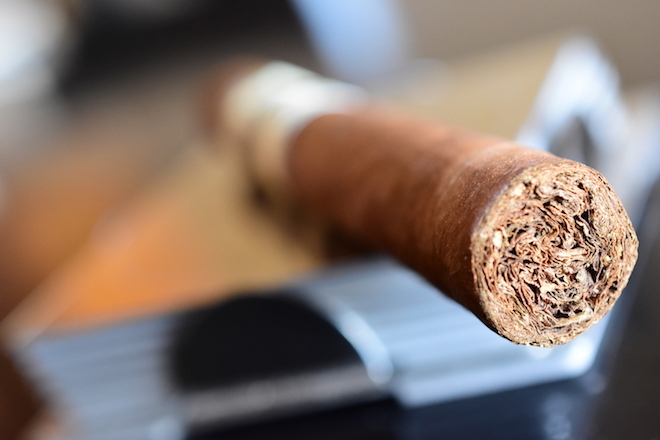 The wrapper feels very thin and delicate while the cigar as a whole is pretty soft and spongy while it carries some rather large veins running up the cigar’s thick body. The Savages is capped off with a long, tapered, pointy torpedo style cap. The cigar carries 2 silver, gold, black and manilla bands. 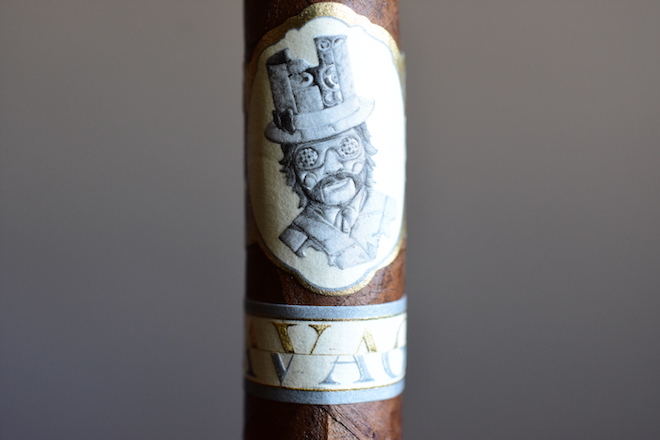 The first showcases a steampunk style character while the second simply states the cigar’s name “Savages”. 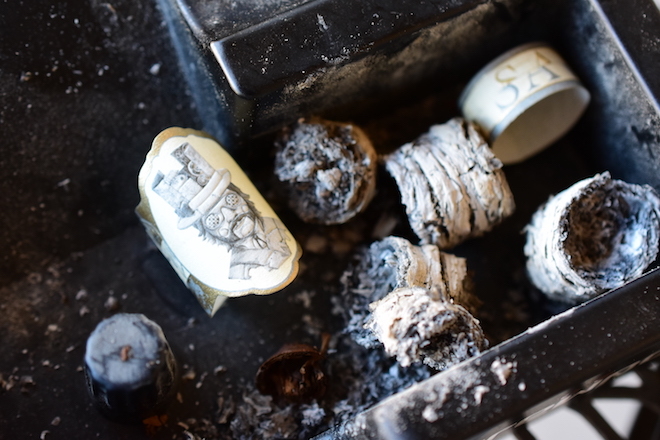 The Caldwell Savages wrapper gives off a whole ton of rich spice, oak, and musk while the foot of the cigar has some pretty potent pepper, spice, and natural tobacco aromas. The cap cut clean and easily using my Xikar double bladed cutter. The cold draw surprised me a bit by being coated with milk chocolate, soft spice, and musk. I was expecting the Caldwell Savages to start with a big pepper blast, but it did not. I was greeted again with the milk chocolate that caught me a bit off guard along with some great spice, musk, honey, and natural tobacco flavors. The draw was a bit snug at first, but I just clipped a bit more of the cap off and it’s now pumping out tons of crazy thick, white smoke while the Savages gives off a good amount of smoke as it rests in my ashtray. The burnline is razor thin and dead even leaving behind a very tightly compacted trail of white ash which held on for about and inch before giving way. Some really potent, very interesting floral notes have really started to showcase their power in the second third of the Caldwell Savages. Behind the floral flavors are milk chocolate, spice, honey, and oak with a nice musky undertone. The retrohale really brings the musk and spice to the front of the flavor profile. The burnline is still rockin’ even as I close out the second third with only a very minor nicotine kick. Well, there is the pepper I was looking for at the start of the experience. Interesting enough it really started to pour on here in the final third along with the spice, and cocoa while the honey, floral, and musk all took a backseat in the flavor department. It took me a total of two hours to take the Caldwell Savages down to the nub. This thing burned so slowly, and I’m cool with that as I really enjoyed it. 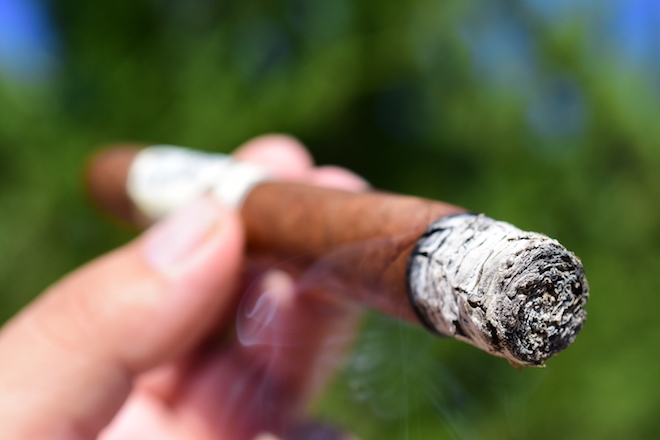 The cigar left me with no harshness, nor any extra heat and only a slight nicotine kick. It definitely wasn’t as strong as I was expecting. I’ve really liked just about everything that Caldwell has released and the Savages only adds to an already long list. In fact, this is probably one of the best blends I have had by the company. It offers a unique flavor profile that delivers in both body and dimension without being too overpowering or strong. Sure, the price is steep but thats expected as Caldwell relies heavily on rare, limited, and vintage tobacco to make each of their blends. 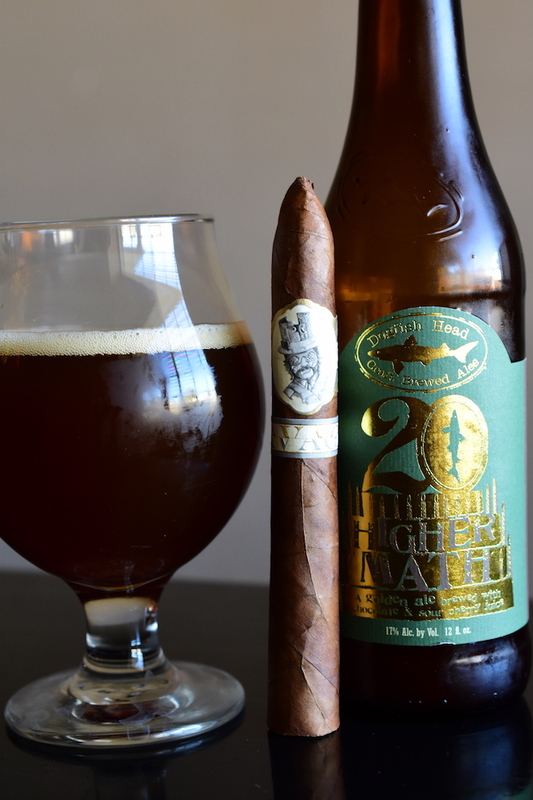 Dogfish Head’s Higher Math is a beast of a beer brewed to celebrate 20 years of Dogfish. Higher Math is a Belgian-style Golden ale brewed with Cherry Juice and Cocoa Nibs which comes in at a whopping 17% ABV. As it states, the beer starts out tart with cherry and pinapple mixed with some great chocolate sweetness and heavy malt with a very thick, heavy mouthfeel before finishing with even more tart cherry, tons of cocoa, malt, and spice with a port-wine style aftertaste with a good amount of booze. This is as close as you can get to a port from a beer and the flavors married up wonderfully with the Caldwell Savages while the cherry added some great character to the cigar.